How did you spend the summer when you were 13? Riding your bike around the neighborhood or scooping ice cream at the local dairy mart, perhaps. Well, things aren't quite like they used to be. For the first time this year, Apple welcomed 13- to 17-year-old app makers to its Worldwide Developer Conference in San Francisco. "We used to think that inviting students as young as 18 years old was great," Apple marketing chief Phil Schiller tells The Wall Street Journal. But he says Apple's iPhone and iPad software, called iOS, has lately attracted interest from an even younger group of developers. "We would get emails after the developer conference from students, 16, 15, 14 years old, saying I already have X number of apps in the app store. I'm a developer. Can I take part in this too?" Schiller says. At this year's event, which took place last week, Apple reported that a few hundred teens and college students were in attendance. But the fact is, even younger kids are making apps now. 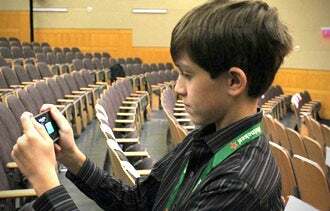 Among the growing list of pre-teen app makers is ten-year-old Henry Maw who recently developed a game app called MonkeyBerry, where players try to catch berries in a monkey's mouth while avoiding obstacles. Maw donates 20 percent of sales of the 99-cent app to charity. 12-year-old Thomas Suarez wasn't able to attend Apple's 2012 developer conference. But next year, he'll be 13 and eligible. At 12,Thomas Suarez has developed several apps including Bustin Jieber, a 99-cent whack-a-mole game featuring Justin Bieber's head. When Suarez was just 9, he downloaded the Apple iOS Developer ToolKit and simulation tool onto his computer and taught himself Python, Java and C.
When Connor Zamary was 7-years-old and in first grade, he developed Toaster Pop, a game app that involves slathering spreads on toast. "He pitched investors, made his own PowerPoint, filled out the paperwork for his LLC all by himself, and he has done conference calls with the West Coast developers," his father Craig Zamary tells CNET. As more videogame-obsessed whiz kids turn to app making, Apple may continue to drop the age restriction for its coveted developer conference -- and who knows, maybe investors will soon take notice too. How young will Apple go? Do you think the company will extend a welcome to kid app makers any time soon? Leave a comment and let us know.